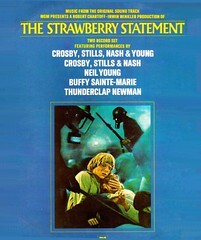 I've never seen the counterculture film The Strawberry Statement (1970), and I don't think I plan to. 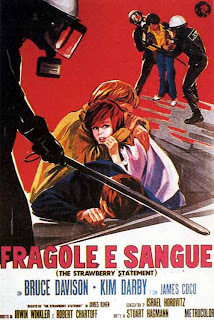 It's one of those protest/student unrest films popular during the late sixties/early seventies. What's that? Never heard of him? He composed the Magnum P.I. theme music! Hell yeah! Retro: You know, I can hear a touch of the Magnum in there, no kidding. I cannot think of a movie I would rather see less than The Strawberry Experiment. I can imagine no worthwhile plot that might accompany that title. I too noticed a faint hint of Magnum PI. Pretty bad when the only redeaming quality of a movie seems to be the embryogenesis of the Magnum PI theme! Back in the day, I read the book The Strawberry Statement, and thought it more than decent--especially compared with other books of that genre. I didn't know that it was a "movie" though, until I was looking at a TCM catalog and saw it was listed. But speaking of bad movies from back in the day, we actually tried to watch "The Big Cube," with The Birds's Tipi Hedren, West Side Story's George Chakiris, and (ostensively) LSD...but we just couldn't do it. Awesome: "I have not seen or read The Strawberry Statement, but it is one of *those* films and here are a bunch of random dismissive generalizations about it." Really you could have ended the sentence after "it is one of *those* films" and maybe a roll-eyes smiley and you would have conveyed the same message. On the other hand: in a sense, YOU are a revolutionary. Defending the walls of the little island you call "I" with the zeal of freedom-fighters everywhere. Kunen would be proud.